The only Record of Agarest War game to not receive a localization has, well, received a localization. Record of Agarest War Mariage has appeared outside of Japan. The former PlayStation Portable game looks a little more crisp than before, has received some trophies and has keyboard and mouse control options. But, people heading into it and expecting a more traditional experience like the ones from past installments will be in for a shock. Corners were cut in the portable release, to allow it to actually run on the system, which means things are a lot less complicated. 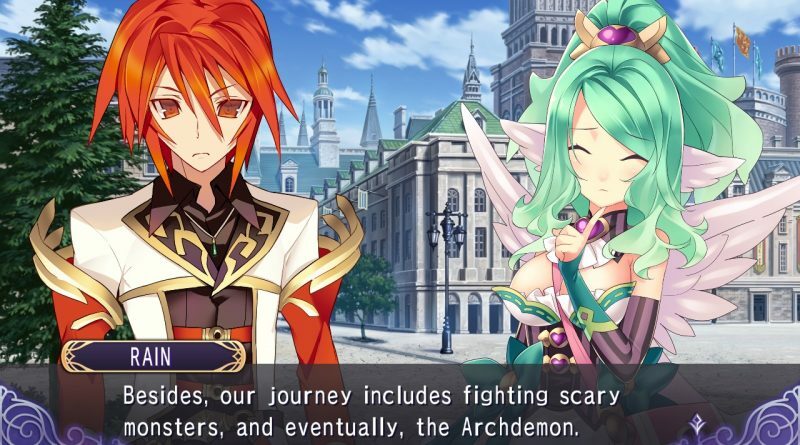 The foundation of Record of Agarest War Mariage begins with the sorts of basics you might find in any JRPG. There is an archdemon in the world. This means everyone’s lives are at stake. The only one who can defeat him is a Chosen One supported by three Maidens. He gets a special Ciel sword, they have special Plumage scarves to show their positions. You head off to save the day, realize it is a much bigger task than anticipated, and it becomes a whole family affair where descendants and their possible love interests get involved. As a word of warning before we get into this, I have not reached the second generation of Record of Agarest War Mariage. There are certain bugs within the game that will cause the game to crash if your Supporter character attempts to use any of the skills that help make it possible to survive later encounters and boss fights, so I have been stuck in the first act of the game. (For example, using a trap or buff will cause everything to come to a halt.) However, the basic mechanics do remain the same throughout the adventure. 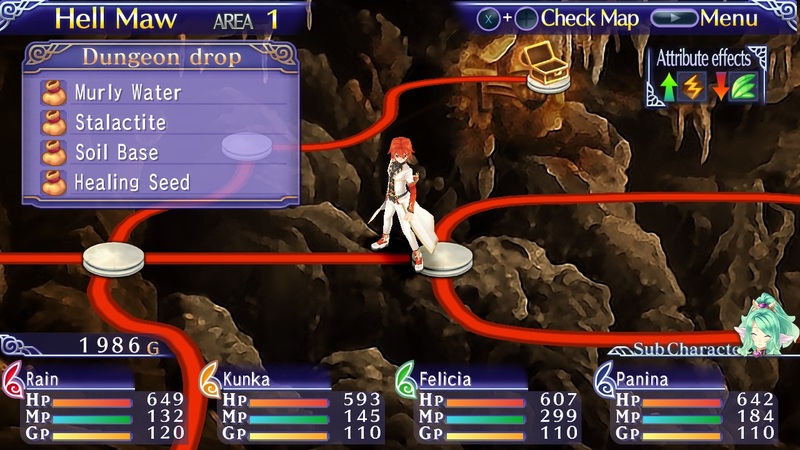 The strategic, turn-based battles with larger parties are gone in Record of Agarest War Mariage. You have four characters who actively participate in every fight. This is the current Chosen One and three Maidens. (Though, sub-characters may join you to offer support along the way.) There are four possible roles: Attacker, Defender, Healer and Supporter. Each character can only possess one role. All fights are turn based, with only attack, skill, item, guard and flee actions possible. It really cuts back on strategic options, since you’ll tend to rely on the same sorts of tactics to survive each situation. The Attacker attacks, the Defender uses the skill that draws all attacks to them. The Healer heals the Defender primarily, but occasionally uses magical skills to attack. Since using an ability like Attack Up would cause the game to crash right now, the Supporter uses physical or magical attacks. The actual exploration is much more limited. The character you set as your visible avatar walks along roads to reach nodes. Random battles can occur as you do. Sometimes, a node will have a note like "Battle" or "Event" on it, signaling a way to advance the story. Finding a way forward can involve revisiting towns to see if the special notations have appeared in an area, signaling a way forward. It is also the way to help make sure romances proceed, by checking at an Inn to see if there is a new scene to see with the marriage candidate you like best. 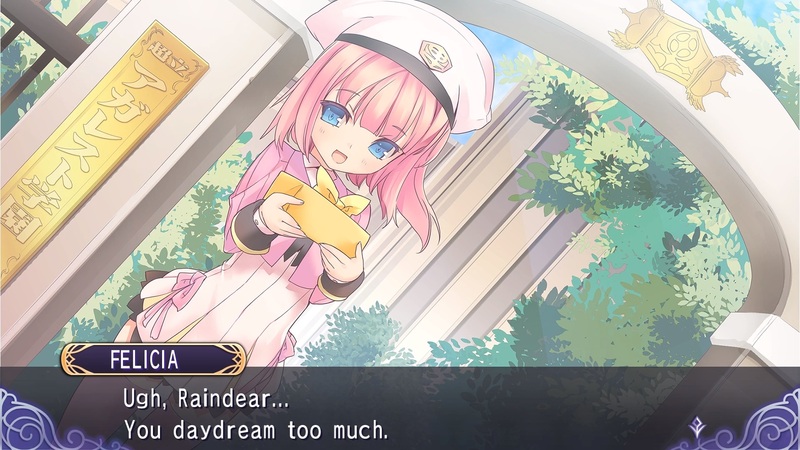 As far as the character development goes and relationship-building elements work, it can feel like Record of Agarest War Mariage cuts corners there too. While the past, numbered installments actually do show some character progression, people here tend to stick to certain established archetypes. In the first generation, Felicia is the childhood best friend who is also rather innocent and naive. What do we know about her as a person? She got lonely when Rain was determined to be the Chosen One and they couldn’t see each other anymore, so she decided to become one of the Maidens and accept the Plumage as a result. Panina used to be in the circus, is the oldest and is the only one aside from Rain that looks like an adult, so she is the most forward one. Kunka looks like a cat, has a massive appetite and is the most childish. All of them like clothing, makeup and Rain. There. That is everything you learn about them after three hours. Building bonds is not as complicated. You don’t have to worry about choosing the right or wrong answers in conversations. Instead, things are a little more automated. There are the inn visits where you can choose to spend time with a specific character to see scenes and boost affection. You can try and make sure people aren’t often hurt in battle. You participate in the touching minigames. You might get items from quests that boost affections. It is very cursory and doesn’t consist of the same sort of depth as a normal dating sim. The result is a game that feels very different from the installments that came before it. 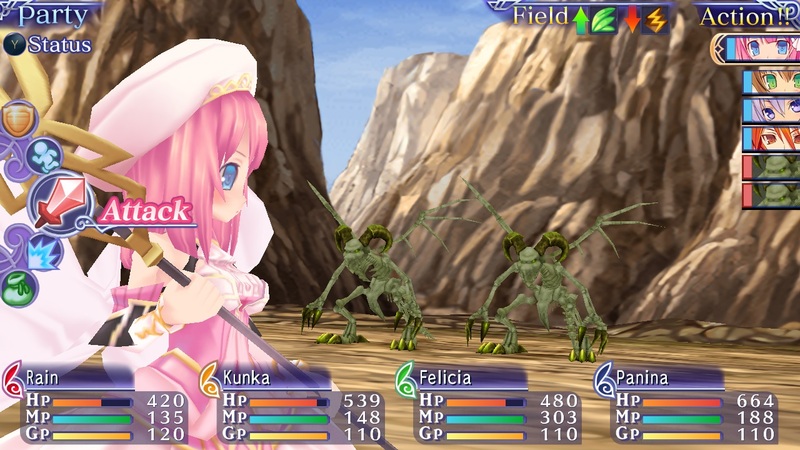 Record of Agarest War Mariage can still feel difficult, due to a need to grind to keep levels up, get better equipment and survive in a game where certain sorts of skills you need to survive currently aren’t working quite right. At the same time, it doesn’t have the same depth as the other entries, since relationship elements are a bit superficial, moving from place to place is very simple, the next step each player should take is telegraphed and it the use of roles mean you’ll have certain people performing the same sort of action each round. It offers some insight into what needed to be done to adapt the series to a handheld, but also might leave those who preferred past gameplay disappointed.